“Flu shot” – two words that cause a lot of debate every fall. Should I get the flu shot? 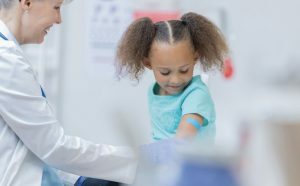 Should I get my children a flu shot? I hope to answer some of those questions for you. While there are many ways you can prevent the flu and other illnesses, the Centers for Disease Control still reports the influenza vaccination to be the single best preventative measure against the flu. The original flu vaccines were introduced in the 1940s, and since then it has protected hundreds of millions of people. I hear so often “every time I get the flu shot, I get the flu.” While I cannot prove that you didn’t get the flu after the flu shot, it is merely coincidence. The flu shot is an inactivated vaccine – it does not cause the flu. Occasionally, some people will have “flu-like” symptoms after receiving the vaccination, but this is a common reaction that your immune system produces in response to any vaccination. It indicates that your immune system is making protective antibodies to the flu virus components in the vaccine. It takes approximately two weeks for the flu vaccine to be effective against protecting you from the flu, so if you develop more than mild symptoms, you most likely were exposed to the flu virus before your vaccine had time to build your immunity. Adults with the flu can be contagious about 24 hours before they develop symptoms. There are two different routes of administration for the flu vaccine for your children. They can have the injection or the mist. The injection is generally given in the thigh for infants and toddlers, and then in the upper arm for older children and adults. The mist is a spray that is administered in the nose. The influenza injection can be given to people 6 months and older. If your health care provider has expressed concerns with someone receiving the flu vaccine due to a health problem or egg allergy, it should be avoided. The FluMist can be given to persons 2 years and older who meet specific criteria. Please talk to your healthcare provider regarding these criteria. While the mist has been off of the market for the past few years, it is returning for the 2018-2019 flu season. While most view the flu as a virus that gets you down for a few days with body aches and fever, it can be much more than that. Every flu season there are numerous hospitalizations and even deaths from the flu. The pediatric and elderly populations tend to have more negative outcomes when infected with influenza than other age groups. Knowing the potential severity of the flu, please consider protecting yourself and your family this flu season. For more information, visit the Centers for Disease Control website at cdc.org.